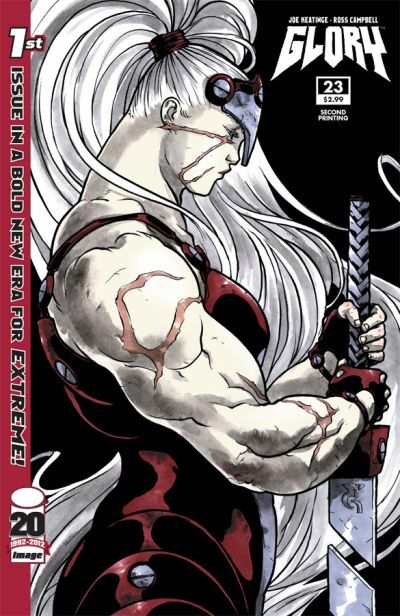 GLORY, the second title in Image Comics’ hotly anticipated relaunch of their Extreme line, has sold out of issue #23 at the distribution level, before it even arrives on store shelves on February 15. Image has immediately gone back to press and a second printing of GLORY #23 (DEC118223), with a new cover by Ross Campbell, will be in stores on the same day as GLORY #24, March 14. GLORY #23 marks writer Joe Keatinge’s and artist Ross Campbell’s bold revival of the Rob Liefeld-created superheroine. Glory has returned to Earth—this time, not to save it but to live as a human among humans. And there are two young women there who have been waiting for her. Keatinge and Campbell bring a euro-comic-meets-indie sensibility to the superhero comic. This sensibility is most visible in the art by Campbell, who is known for his realistic and varied depictions of women in his books Wet Moon and Shadoweyes, but also present in the inclusion of new characters Riley and Gloria, through whom the reader gets to know the god-like warrior princess.